After access to the retroperitoneum has been achieved, precise finger dissection is critical to establish the proper surgical plane between the posterior reflection of Gerota's fascia and the anterior psoas muscle fascia. cCook, Bloomington, IN. dEthicon, Somerville, NJ. FIGURE 7 ■ Division of the vascular pedicle. The renal artery has been ligated and divided with clips and the vascular stapler is positioned across the renal vein. FIGURE 8 ■ Specimen is entrapped in the extraction bag with delivery ring to hold open the bag. This is accomplished by a scoop-and-roll technique. Because the working space in the retroperitoneum is small, optimal placement of the secondary working ports is also critical. Dissection of the renal hilum is aided by observing vascular pulsations. Renal mobilization is accomplished by using a combination of sharp, blunt, and electrocautery dissection. Failure to accurately initiate this surgical plane will complicate balloon dissection of the retroperitoneum by allowing the balloon dissection to occur anteriorly between peritoneum and Gerota's fascia. When finger dissection and balloon dissection occur in the proper plane, the kidney will be mobilized and rotated anteriorly, and later insufflation of the retroperitoneum will hold the kidney in this position. Surgeons with limited experience in retroperitoneoscopy may find it beneficial to mark out external landmarks (tip of the 11th and 12th ribs, anterior margin of the psoas muscle, and the iliac crest) and to use bimanual palpation of both the posterior abdominal wall and the kidney anteriorly to help establish the proper surgical plane for finger dissection. The posterior port needs to be placed approximately 1.5 cm inferior to the 12th rib and approximately 1.5 cm above the psoas/paraspinal muscles. If the port is placed too close to either of these structures, it will limit mobility of the laparoscopic instruments. Likewise, if the anterior working port is placed too close to the iliac crest, it will also have limited mobility. The anterior port should be placed approximately 3 cm above the iliac crest in the mid-axillary line. If the anterior port is placed too far anteriorly without adequate prior finger dissection and mobilization of the peritoneum, the port may puncture the peritoneum. Arterial pulsations are characteristically monophasic while venous pulsation or the pulsation of the inferior vena cava is typically biphasic. If the dissection occurs more distally into the renal hilum, multiple branches of the bifurcated renal artery are encountered, necessitating either more proximal dissection or clip occluding the branches individually. After clipping and dividing the renal artery, the renal vein should be collapsed. Failure of the vein to collapse may indicate addition renal arteries. Confirmation of additional renal arteries can be assessed by temporarily occluding the renal vein by passing a large right-angled dissector across the vein like a vascular Satinsky clamp. A 10-mm fan retractor opened slightly is a useful instrument to facilitate renal dissection and mobilization. 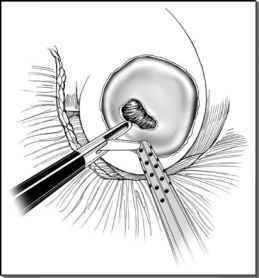 Anterior dissection should be performed with precision and care so that a peritoneotomy is avoided. If an incidental peritoneotomy is made, the potential space in the retroperitoneum will collapse because of equalization of the pressure gradient across the peritoneum and retroperitoneum. In such an instance, further mobilization of the kidney will be difficult and tedious but may be aided by the insertion of a third working port to help hold back the peritoneum. Electrocautery applied to anterior structures should be used cautiously so as to avoid potential bowel injury. With the laparoscope positioned looking down on the kidney and the extraction bag, entrapment is aided by lifting the kidney with the surgeon's nondominant hand so the bag can be deployed with the delivery ring under the kidney. Alternatively, if the specimen is large, entrapment is aided by creating an intentional peritoneotomy and entrapping the kidney in the peritoneal cavity. If a hole in the peritoneum occurs early in the procedure, the surgeon may elect to convert the procedure to a transperitoneal approach. The most efficacious way to prevent extension of CO2 gas through the tissues is to limit CO2 gas insufflation to 12-15 mm Hg pressure, and with the use of a primary camera port with a mechanism to create an air-right seal between the retroperitoneum and the patient's external skin such as the blunt-tip port with its internal fas-cial balloon. Placement of the posterior port 1.5 cm below the 12th rib and 4.5 cm above the psoas will result in safe port placement. Bleeding from the renal hilum is avoided by meticulous dissection with circumferential control and isolation of the vessels prior to applying clips or the vascular Endo-GIA stapler. If a hole is made in the renal vein and the insufflation pressure within the retroperitoneum exceeds the venous pressure, CO2 embolization through the hole is possible. The vein should be compressed with an atraumatic forceps or alternatively compressed with a forceps padded with absorbable Surgicel after which the vein is sealed and divided with an Endo-GIA vascular stapler.